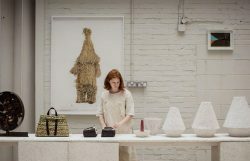 It’s London Design Festival and the world’s coolest and most innovative designers flock to the capital to showcase their work. If you are looking for interiors’ inspiration, or just want to be a part of this exciting event, read our guide to what’s hot this autumn. Pimlico Road has long been the destination for craftsmanship and quality furniture design, with everyone from David Linley to Jamb, creating bespoke works of beauty, ready to adorn London’s finest homes. 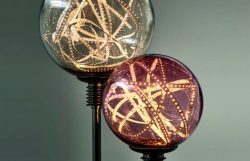 Let there be light at Promemoria, with its stunning collection of lamps is based on research into light technology. Their display includes the launch of Will o Wisp lamps controlled by Apple HomeKit. Words are as essential to design as colours. Afterall, type face and letter characters have always been the building block of creatives. 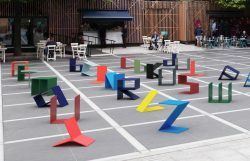 Now, Kellenberger-White have taken design evolution to its natural next step, by seamlessly merging typography with furniture design to create these innovative ‘Alphabet’ chairs. The colours were chosen from a specialist paint manufacturer used for industrial metalwork, including International Orange, seen on the Golden Gate Bridge in San Francisco. From an area filled with creative forces such as The Royal College of Art and the V&A, it’s no surprise that the Brompton Design District was the first London Design Festival district. After 12 years, it is still the home of international design brands with The Conran Shop at its heart, showcasing the very best up and coming international designers. Not forgetting, the history of design, the V&A is celebrating the 300th anniversary of Thomas Chippendale’s birth, with a display of his original privately-commissioned furniture designs and those he published. Chippendale’s drawings showcase the enduring appeal of his creations, providing a creative benchmark that will continue to inspire generations to come. 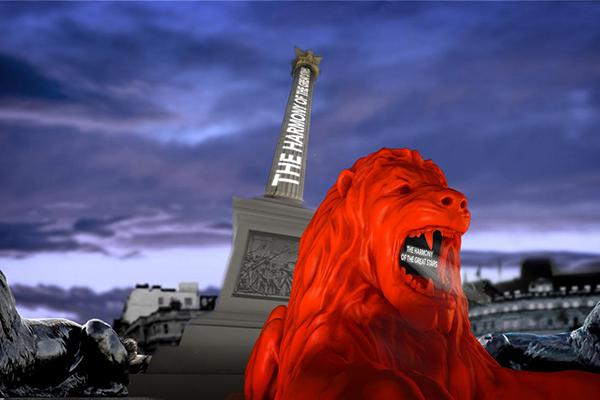 Ever wondered what it would be like for those monumental lions in Trafalgar Square to come to life? For the first time in their 150-year history, the bronze lions will roar poetry. And you can ‘feed the lion’ logging onto the Design Festival website and nominating a word that will be added to the stream projected from its mouth. Have fun climbing up and down this fun modular interactive maze from Waugh Thistleton Architects in The Sackler Courtyard at the V&A. The pavilion (made from carbon-neutral American hardwoods) aims to raise awareness of alternative architecture solutions. The V&A is The Festival Hub, so it’s the perfect place to start your Design Week exploration. 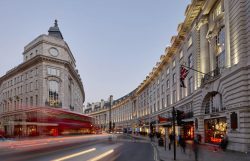 This combined district is home to stylish boutiques and cultural design icons, including Liberty and Fortnum & Mason. Check the website for a host of activities, but it is worth noting you can explore the dramatic changes in London’s architecture through the ages, by joining a guided cycling tour, Design Ride with Rapha, to explore some of London’s most iconic architecture on a guided cycling tour. Nothing says ‘Fortnum & Mason’ quite like afternoon tea. 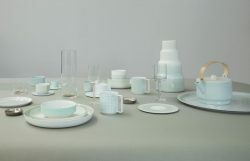 Celebrating 300 years of tradition and the ritual of tea-drinking, this installation from Dutch designers, Scholten and Baijings, cleverly brings together Fortnum’s distinctive Eau-de-Nil colouring, with 80 products curated to showcase different designers from around the world in different shades of green. The Eau-de-Nil marble floor and tables have been produced by Italian marble manufacturer Luce di Carrara, and American textile company, Maharam, have woven the long grey wool Grid curtains in the UK. The special green upholstered chairs are furnished by HAY, Moroso and Karimoku New Standard. 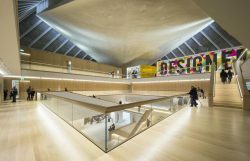 The original home to design exhibitions, London’s Olympia, is undergoing a major transformation. Head over to this distinctive building to see how this space is being adapted for the future, while keeping its feet firmly linked to its heritage. Victoria has undergone a facelift in recent years, unravelling like a swan preening itself above its former duckling-self. If you’re looking for nourishment during the Festival, then head over to Victoria Connections, which is home to a smorgasbord of culinary delights with cafes, bars and restaurants, offering food from across the globe. For theatre-lovers, The Apollo Theatre is opening its doors with a guided tour and talk on how it has evolved from a cinema in the Thirties to becoming home of award-winning musical, Wicked, today. Contact Henry & James for a free property valuation or to let your home on Tel 020 7235 8861 or email: belgraviaoffice@henryandjames.co.uk.